I just noticed that I have not posted in two weeks. My apologies to those of you who read this regularly; it has been quite a tumultuous time, with many ups and a few downs and a lot of living to do before, during and after same. Last Sunday was an 'up' day. 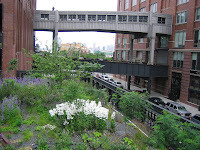 I started it with a trip to the new High Line, which is landscaped with an unerring regard for both the "natural" and the manmade (a couple of photos below). The essay about this effort by the Times' architecture critic Nicolai Ouroussoff (a name seemingly out of Tolstoy) is worth reading, as is the profile of its landscape architect James Corner (if his name had been Street, would he have had a different career?). It is so meticulously kept that at 10 a.m. a smiling staffer was sweeping gravel off the railroad ties in a most Zenlike way. The High Line provides a whole new perspective on everything visible from it: the meatpacking district, the gleaming buildings of Jersey City, the piers, the top third of the Empire State Building. And it brings a tamed beauty to a decaying mess and many ways to find a vantage point on same, which is all any of us can ever hope to do, and want. Next time I go, I plan to a) meditate and b) bring bubbles, both drinkable and blowable, for an even more uplifting experience. Which is what I had that night when I took myself to see Up. It is a magnificent piece of filmmaking that, while sometimes sentimental, is hardly ever mawkish. Contained within it is a touching love story, a thrilling adventure, some important life lessons (including the one meant for me about perseverance) and some very funny bits about dogs. It's especially good in 3D, and I kept the glasses so I could keep seeing the world in 3D, instead of flat, as it so often can be. And the downs? The mothers of two of my closest girlfriends seem to be losing their battles with illness. And while that makes me especially appreciate my own parents (it's Father's Day today and I'm visiting my dad, who's across the table from me as I write), I feel sorrowful for my friends and for their moms, feisty women whose company I've enjoyed. I'm also at what appears to be the end of a romantic journey that has had many twists and turns, complete with the very recent and somewhat dramatic reacquisition of many of my personal effects. So I'm now at the beginning of a new phase in my life, which is simultaneously terrifying and exciting, like realizing your house is flying thanks to a large and unwieldy cluster of balloons and having no idea where, or how, it will land - or if you even want it to. 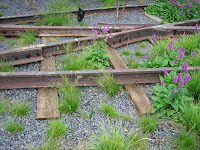 Rust on the tracks, planted. Looking west from the High Line at (I think) 16th Street. Did you know that O'Connor's story collection was featured (briefly!) in this year's season finale of "Lost"? That was enough to get me to read it; I enjoyed it very much, though I synopsized it for a friend as "someone means well/ill; someone has stroke/heart attack/meets terrible act of violence; the end."